The newly elected chairperson of the Mayo Association Dublin Julie Doyle and the outgoing chairperson Paul Sammin. A new year in the life of Mayo Association Dublin was marked by the 2017 annual general meeting held recently in the Sandymount Hotel, Dublin 4. The new chairperson is Julie Doyle, the fifth female chair since the association's foundation in 1905. Another woman to take a position at the top table is Grace Heneghan, who will take over as secretary. They join Bernardine Walsh-Cummins (public relations officer ), Michael Kealy (treasurer ), Mona McGarry (president ), Eddie Melvin (vice president ), and Frank Fleming (honorary life president ) who were reappointed to their offices for a second year. 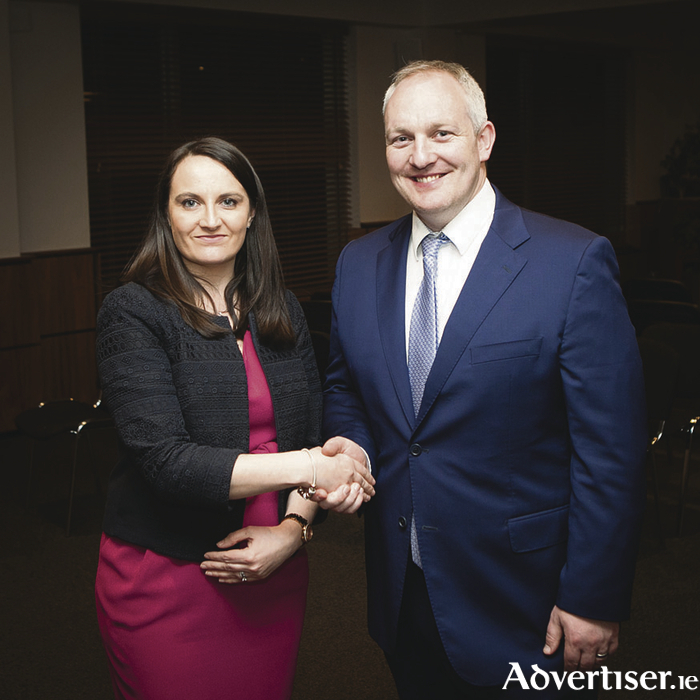 Chairperson Julie Doyle commented on the night, saying she hopes to involve the association in more charitable work throughout her tenure and she will also strive to take the association into the 21st century by becoming more relevant and linked in to the business community in Dublin. She expressed gratitude and excitement on the night as she looks forward to steering the Mayo ship into bright waters. A new executive committee was elected and the Association were delighted to welcome newcomers Orla Fitzpatrick, Derek Reilly and Keith Guthrie to its fold. The newly elected committee comprises the following; Helena Kelly, Paddy Moran, Maeve McLoughlin, Diarmuid McLoughlin, Fr Gerry French, David Rafter, Eddie Melvin, Teresa Ruddy, Rosanna Loftus, Derek Reilly, Orla Fitzpatrick and Keith Guthrie. The Association thanked the outgoing chairperson Paul Sammin for his hard work and dedication over the past two years and wished him well with all future endeavours as he and his family relocate to his home town of Louisburgh. It was noted that Julie Doyle's experience in the past two years as Honorary Secretary will stand to her as she moves into the chairperson’s seat. The Mayo Association remains the largest and best supported Association nationally and internationally. The Association is open to those of Mayo origin or of Mayo parentage living or working in Dublin. New members are always welcome. Are you ready to Love Lannagh ?